Powers/Abilities: Zeitgeist exists a split second out of synch with the rest of the universe. 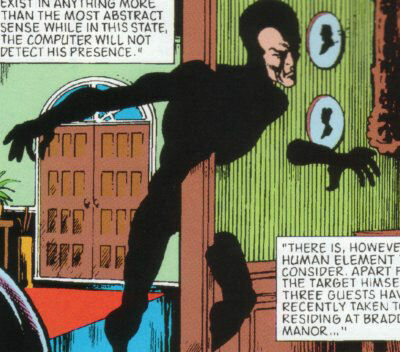 As a result he isn't really "here" except in the most abstract sense, and can thus pick and choose which parts of our reality to interact with - allowing him to walk through walls while simultaneously hitting people. He is invisible to all artificial sensors while in this state. History: Zeitgeist is a "parahuman" and member of the extra-dimensional Special Executive. Like many of their number he is a Gallifreyan, one of the prototype "Loom Borns" created by Rassilon after that race was rendered sterile millennia past. Fuller profile to follow.